The Beautification Committee works year-round to keep Oakhurst looking great. The committee oversees the trees and plantings in our neighborhood common areas. The committee also organizes a volunteer clean up in the spring and fall to keep our streets and surrounding streets tidy. 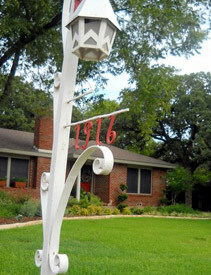 Each month, the Beautification Committee selects a Yard of the Month to promote the upkeep of our homes and gardens. Contact the Beautification Committee if you are interested in joining! 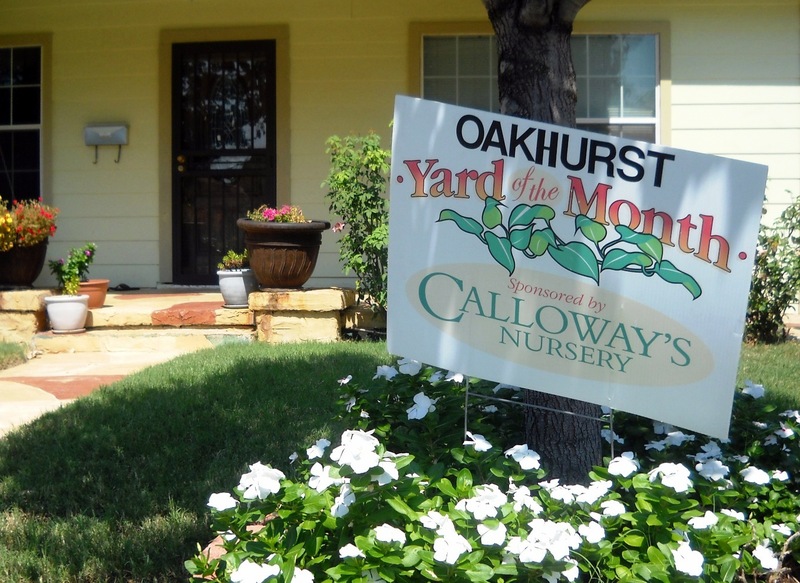 The Yard of the Month award is a recognition of Oakhurst residents' yards by fellow neighbors. If you are interested in nominating one of your neighbors for this award, please complete the nomination form and return to the Beautification Committee. All nominations will be considered, and the Beautification Committee (including at least one resident Master Gardener will select a winner. 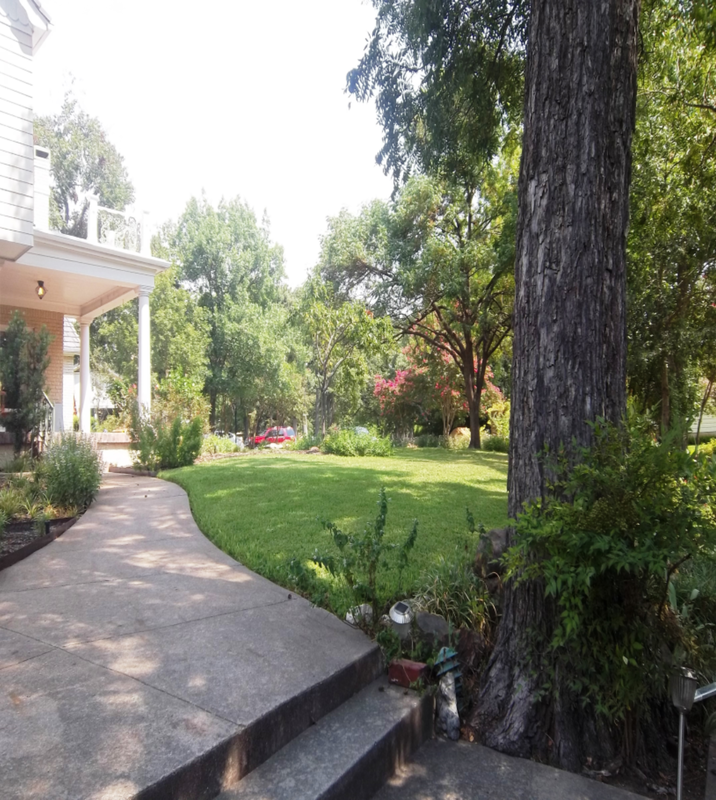 Criteria for Yard of the Month include, but are not limited to, neatness, consistency in keeping the yard well-groomed, beauty, landscaping, and so on (a block of particularly well-kept yards may also be honored). 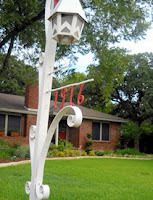 The Beautification Committee will select an honoree for a write-up in the monthly Oak Leaflet. Yards that do not win in a given month may be nominated any following month. 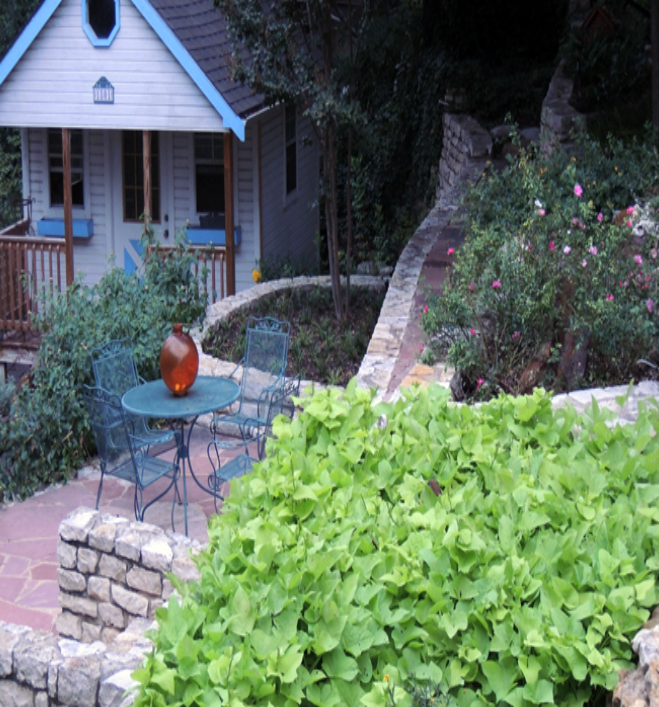 Click here for a list of past Yard of the Month winners. Mid- to upper-90s is what my thermometer—that’s in the shade—has announced since the beginning of June. But in the last day or so we’ve been blessed with two-and-a-half inches of rain. Yes! My neighbor calls it, "Money from the sky." Of course he’s absolutely correct. Whether you harvest the rainwater or turn off your sprinklers, there’s nothing like an inch or two from the heavens to help your water bill. For me, the real joy of summer rain comes from its almost instant impact on our front yard gardens. I just got back from an Oakhurst walk in the rain with my Lucky dog. The St. Augustine lawns look like carpets of emerald green moss. Now, I know this is a temporary, rain-induced condition, but why not enjoy the moment! In Oakhurst we’ve got old-fashioned, Texas hardy summer bulbs blooming everywhere: cannas, daylilies, crinums, tiger lilies, and crocosmia. I even spotted an old heirloom Southern bulb, a tropical spiderlily, called 'Tropical Giant,' just starting to show off its white spidery blooms. Other sun-loving perennials that look beautiful were the black-eyed susans, purple coneflowers, and whirling butterflies. ‘Sometimes-perennial’ lantana in the multi-colors or Texas gold yellow were stunning spilling out of containers or matched with a few orange tiger lilies and red cannas in my neighbor’s sunny side yard. Oakhurst boasts a great assortment of hardy hibiscus and rose-of-sharons both in tree and shrub varieties. These need sun to get lots of blooms, but the rose-of-sharon can get by with some shade. One of the best summer bloomers for our part of the world is the crape myrtle (or crepe myrtle). The ones on the Yucca-Oakhurst Scenic Drive triangle bed look particularly good. In the more shaded Oakhurst front yards, I spotted lots of perennial garden phlox in bloom. 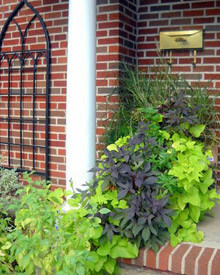 A few yards had caladiums (annual), coleus (annual) and elephant ears (sometimes perennial) mixed in with woodland ferns (definitely perennial). On Marigold, one yard has containers in the full shade of English ivy, elephant ears and white-leaved caladiums—they literally glowed in the rain this morning. I didn’t see any Turk’s Cap (perennial) this morning; mine’s still not blooming, but it will give you red, white or even pink-peach flowers in the shade. It blooms even better with a little sun. I love annuals for the instant color they bring to the garden. I can’t afford to use dozens of flats, but a dozen 4 inch pots of annuals planted correctly can get a lot of inexpensive color. Spacing them too far apart in a straight row is not the way. For a small but vibrant mass of color try five or six 4-inch zinnias (sun) or begonias (shade) planted 4-6 inches apart in a staggered pattern. If you’re a little more adventurous try planting zinnia seeds. You must follow the instructions but for $1.99, you’ll get weeks of flowers if you regularly cut them for bouquets. If you can find firm caladium bulbs, these can be planted through mid-July for very inexpensive color. 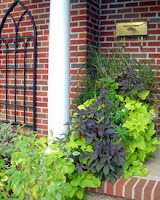 It’s better to plant perennials in the spring or fall, but you can plant warm season annuals right through Labor Day. You must provide a regular source of water until established and then not let them get too dry. A water-soluble fertilizer, such as Miracle Gro, every few weeks helps keep them healthy and blooming but it’s not absolutely necessary. A 2-cubic-foot bag of mulch costs $3.00 at Walmart and it will save you more than that in water! Or get it free at the City’s Rolling Hills Tree Farm or at any of the three City Dumps (aka Drop-Off Stations). You can start containers at any time also. Bigger containers with good potting soil and mulch will help keep your containers from drying out and dying quickly. 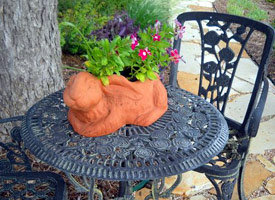 In the heat of a Texas summer, especially those placed in the sun, containers require daily watering. 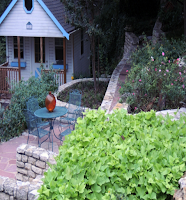 The plants that grow well in your neighbor’s yard should do well in yours, too. 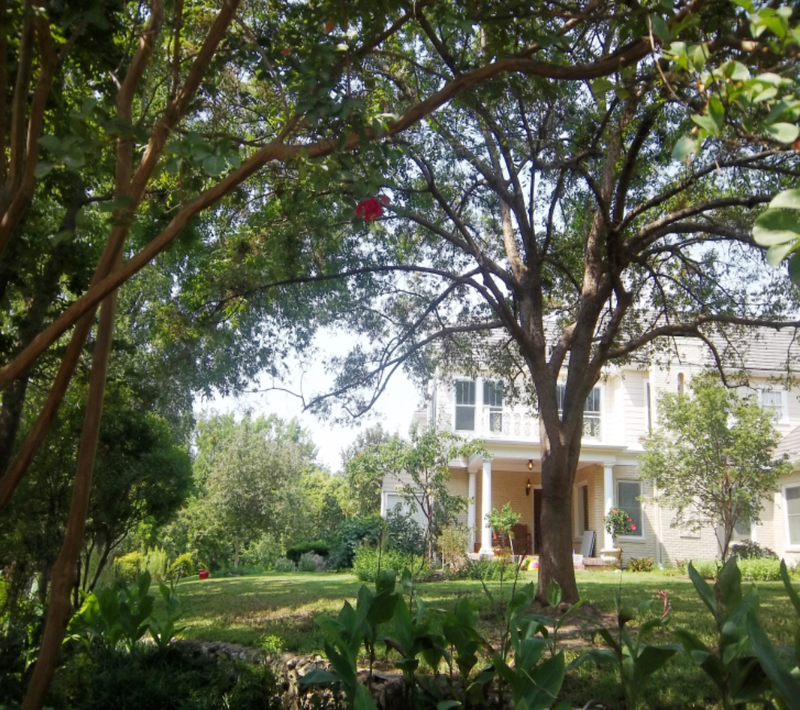 For complete lists of Texas summer and fall blooming perennials and seasonal annual color, visit Aggie Horticulture or call me (817.239.9433) to pick up lists. I know I promised you curb appeal improvement at NO cost, but that’s hard to do when it comes to adding plants to your front yard. If you have a neighbor with lots of summer-blooming perennials, you can ask for a few when she divides them in the fall. Or propose a trade—a dozen homemade cupcakes or a couple hours of babysitting should work just fine. Same goes for seed collection. I have some Mexican Cosmos seed (annual) just for the asking. You can still plant these for a spectacular autumn display. Best of all, just keep your fingers crossed for a little more of that summertime free rainfall. Growing grass in Texas requires a lot of time and effort, but even when done correctly, Mother Nature often prevents a lush beautiful lawn. 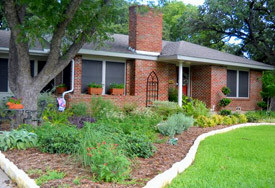 For most homeowners, the front lawn remains the centerpiece of good curb appeal. These fall pointers for St. Augustine grass (most common grass in Oakhurst) will give you a healthier lawn. With recent high temperatures and humidity, brown spots are common. St. Augustine can go dormant (dead on top, alive at the roots) in the summer, but more likely you have dead grass. The most common cause of brown spot is insufficient water. The easiest and cheapest solution is to give your lawn a thorough watering. Stick a hand trowel or shovel 5-6 inches into the ground; the soil must feel moist. This physical check MUST be done. No matter what kind of sprinkler you use, the key will be to water slowly over a longer time. Dormant grass will green up quickly. With dead patches, the surrounding green grass will put out runners that will eventually fill the dead spot. This will most likely require supplemental watering through October. Check How to Water Your Lawn Efficiently. If thorough watering is not greening up the lawn, your problem may be one of a few diseases or insect problems requiring chemical intervention. Check AggieTurf for identification and treatment. Do not fertilize if watering doesn’t work; fertilizer makes some problems worse. If you can’t wait for the runners to fill in or if you’ve lost a large amount of grass, you can start new St. Augustine. Plant sod or plugs through September. Check AggieTurf for more information. It’s normal for even a healthy lawn to get a few weeds. Think twice about using a fall pre-emergent chemical control (kills the seeds before they grow) that promises elimination of late winter/spring weeds. The common henbit (little purple flower) can be killed by mowing. For dandelion, a pre-emergent may get the few seeds that survived the summer heat but it won’t touch the established dandelion with its long tap root. Even the use of a spring post emergent (kills the roots) won’t eliminate it all. Dig it out by hand. Vigilant chemical weed control in athletic turf may be necessary, but it’s questionable for home lawns. Identifying weeds and correctly using the right chemicals requires your time and money. It’s better (and cheaper) to grow a healthy lawn. For a thorough but easy to understand guide, visit this link. Fall is the time for lawn fertilizer. Do this by the end of October. This assumes you have a recent soil analysis indicating fertilizer is needed and what kind to use. If not, consider foregoing fertilizer—use the saved money to get one done. Call 817.884.1944 to request a kit. Every grass grower should check AggieTurf to maximize the benefits of fertilizer and avoid common problems (including washing excess fertilizer into our waterways). Never use a “weed and feed” product, never, ever, ever……no matter who recommends it. Luxuriant green grass all winter can be yours by overseeding with perennial rye grass seed by mid-September. It means continuing to mow every week too. Check www.neilsperry.com (most frequently asked lawn questions) for the pros and cons. Remember that using a fall pre-emergent weed control also kills the rye seed. 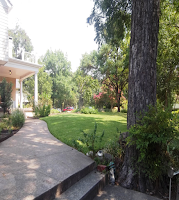 In the beginning of this column, I mentioned keeping a healthy lawn in Texas requires WORK. If you found this abbreviated list overwhelming, consider replacing some or all of your lawn with larger flower beds, a water feature or a gazebo. You can dream and plan this over the winter…that is, if you’re not outside tending to your winter-rye front lawn.